Porsche 911 GT3 R Hybrid uses a flywheel instead of a battery to provide electrical energy. STUTTGART -- Porsche will bring its latest hybrid expertise to the racetrack in the form of the new 911 GT3 R Hybrid, which will make its public premiere at the Geneva auto show in early March. Developed by a team of engineers at Porsche's Weissach R&D center, Porsche plans for the stripped-out race car to act as a rolling laboratory. The German carmaker wants to explore the potential of hybrid drivetrains in a racing environment before an expected announcement that it will return to the 24 Hours of Le Mans in a factory capacity, perhaps in 2012, with a race car boasting technology based on that used in the 911 GT3 R Hybrid. Based on Porsche's recently revealed 911 GT3 RSR, the R Hybrid eschews conventional hybrid technology for an advanced new electro-mechanical flywheel system. 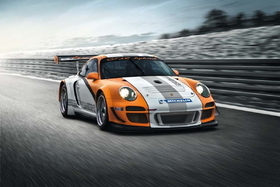 Porsche sources said that the company is considering the system as a means of boosting the performance of its future race cars, and that the technology could end up on selected road cars, including a planned hybrid version of the 911. The new hybrid technology forms part of a broader program that goes under the name Porsche Intelligent Performance. The flywheel is mounted in the space usually reserved for the passenger seat on road versions of the 911 to provide the new racer with a low center of gravity. Charged by kinetic energy created under braking and capable of operating at speeds of up to 40,000 rpm, the flywheel is used in place of a conventional battery to provide electrical energy to a pair of 60-kilowatt motors mounted within the front axle assembly and propelling the front wheels -- a layout that effectively provides the 911 GT3 R Hybrid with four-wheel-drive capability. The two motors assist the engine, a 480-hp naturally aspirated 4.0-liter version of Porsche's traditional flat-six that drives the rear wheels, providing a maximum eight-second burst of propulsion to the front wheels for added acceleration out of corners and increased overtaking ability at the press of a button. Porsche has made no official performance claims for the 911 GT3 R Hybrid. Instead, its engineers point to the benefits its new system brings in overall fuel economy, something Porsche considers crucial to establishing a winning formula for future success in long-distance sports-car racing. Following its unveiling at the Geneva motor show, Porsche plans to run the 911 GT3 R Hybrid in this year's Nürburgring endurance racing series, culminating with a factory-backed entry at the circuit's famed 24-hour race May 15-16.